"We Help U Help Others"
We're hosting an exciting evening of food, wine and music ... all to benefit the Fort Myers "BEACH BASH" in their support of improving Autism-related services in Lee County with the goal to bring much needed new capabilities to diagnose and treat children with Autism Spectrum Disorders (ASD), a growing spectrum of conditions estimated to affect 1 of every 88 children. There is a very limited array of autism-related services to help those with ASDs between Miami and Tampa Bay. We aim to raise funds to focus on these vital local needs! This dinner event is being held at the beautiful and exclusive Club at Barefoot Beach. 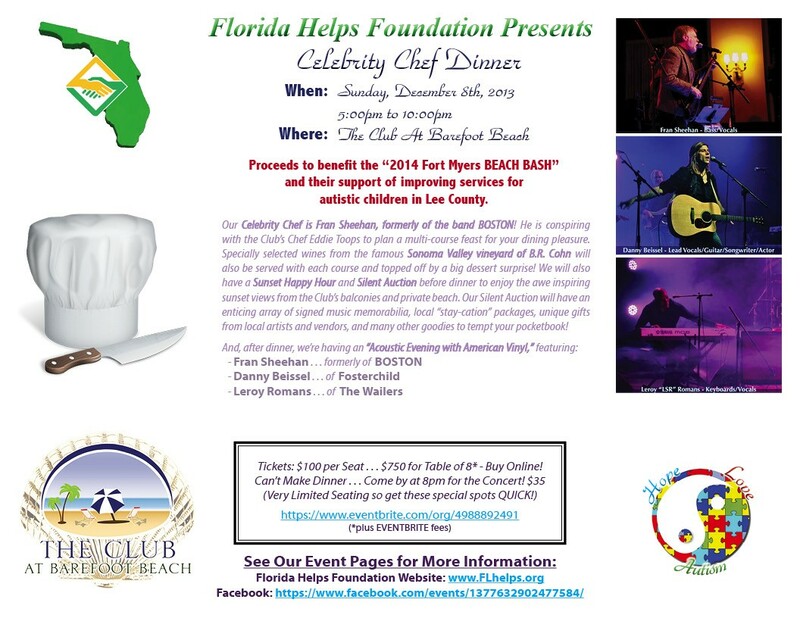 Our Celebrity Chef is Fran Sheehan, formerly of the band BOSTON! He is conspiring with the Club's Chef Eddie Toops to plan a multi-course feast for your dining pleasure. Specially selected wines from the famous Sonoma Valley vineyard of B.R. Cohn will also be served with each course and topped off by a big dessert surprise! We will also have a Sunset Happy Hour and Silent Auction before dinner to enjoy the awe inspiring sunset views from the club's balconies and private beach. Our Silent Auction will have an enticing array of signed music memorabilia, local "stay-cation" packages, unique gifts from local artists and vendors, and many other goodies to tempt your desires! Dress is "Bahama Chic". Tickets are $100 each or $750 for table of 8*. Can't make dinner? Come for the post-dinner concert for $35. Portion of this ticket, along with any other donations, are tax deductible and you will be provided with a receipt for that purpose. We look forward to seeing you there ... For the KIDS! !